Earlier this month, Penashue said he was considering running again. 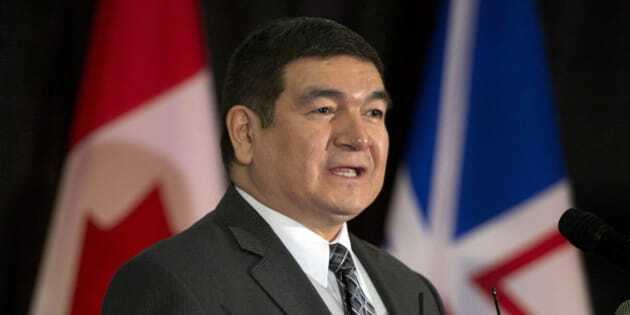 OTTAWA — The online list of election candidates for the Conservative party now includes Peter Penashue in Labrador, a former federal cabinet minister who stepped down over illegitimate campaign expenses in 2013. Penashue couldn't be reached for comment after his name appeared on the party's website Thursday, but a Conservative source said the former intergovernmental affairs minister is expected to announce his candidacy Friday. Last month, Penashue said he was considering running again after gauging support in the sprawling riding. In the 2011 election, the Innu leader was the only Conservative to win a seat in Newfoundland and Labrador, edging out the Liberal incumbent by a slim 79-vote margin. He stepped down from politics in March 2013 amid mounting questions about his campaign financing. Penashue lost a subsequent byelection two months later to Liberal challenger Yvonne Jones. Reg Bowers, Penashue's former official agent, was later charged under the Canada Elections Act with three counts involving acceptance of illegal funds. Last month, seven companies acknowledged giving illegal donations to Penashue's 2011 campaign. The admissions of responsibility, spelled out in agreements struck with the commissioner of elections, did not constitute a criminal conviction or create a criminal record. Executives from six firms admitted they directed their companies to donate $1,000 each to Penashue's campaign. As well, the CEO of Pennecon Ltd. said six of his company's officers were involved in donating a $5,500 corporate cheque. Penashue now works as an adviser for the chief of the Sheshatshiu Innu First Nation in central Labrador. At dissolution, the Liberals held four of the seven seats in Newfoundland and Labrador, while the NDP had two. Independent MP Scott Andrews, who left the Liberal caucus last March after being suspended for alleged sexual misconduct involving a female NDP MP, is contesting the riding of Avalon southwest of St. John's. Andrews says the allegations were never substantiated.